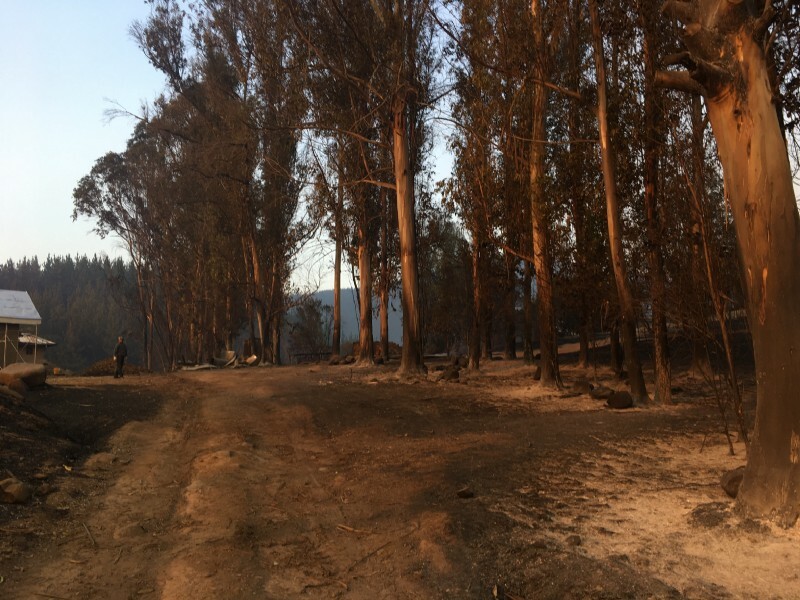 The devastating inferno: thoughts from the farm after the fire. At the time we had to go straight into recovery mode as all infrastructure except the main buildings was destroyed (water, electricity etc) so I didn’t get round to sharing about this until now. 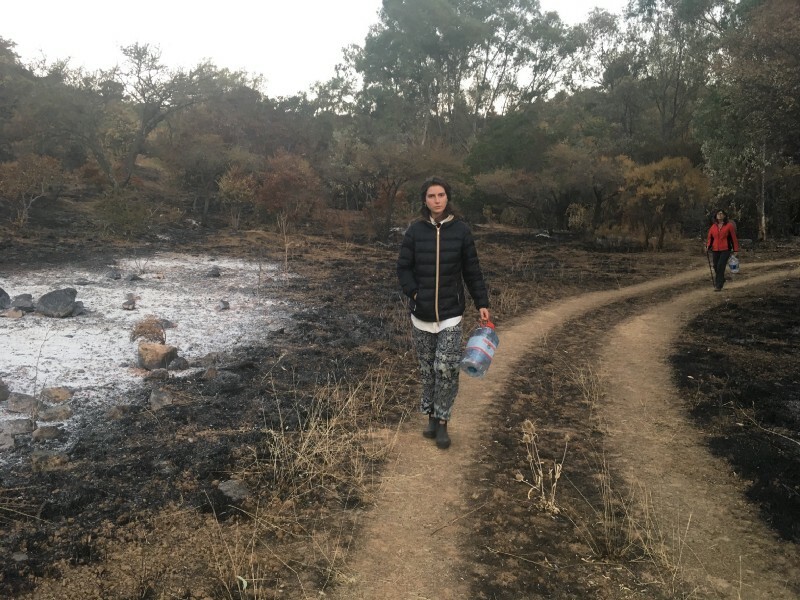 Walking back from the spring with drinking water, all the water pipes and tanks melted in the fire. Everyday we are still recovering from the fire and will be for a while yet, things like the 4km of fence that needs replacing so the neighbours cows don’t come and eat the olives seems an overwhelming task…but there is hope as the rains have come and the land is covered in green once again. The barren trees may still have life in them yet, we will see in the Spring. Just days ago, the fire ripped through our farm from the pine forests, leaving nothing to spare. The entire valley is black. The spines of pines stand like statues. Years and years of life lost in a matter of hours. Eight years of care, planting, replanting, nurturing, picking off bugs by hand, watering, observing… all singed in a matter of minutes. 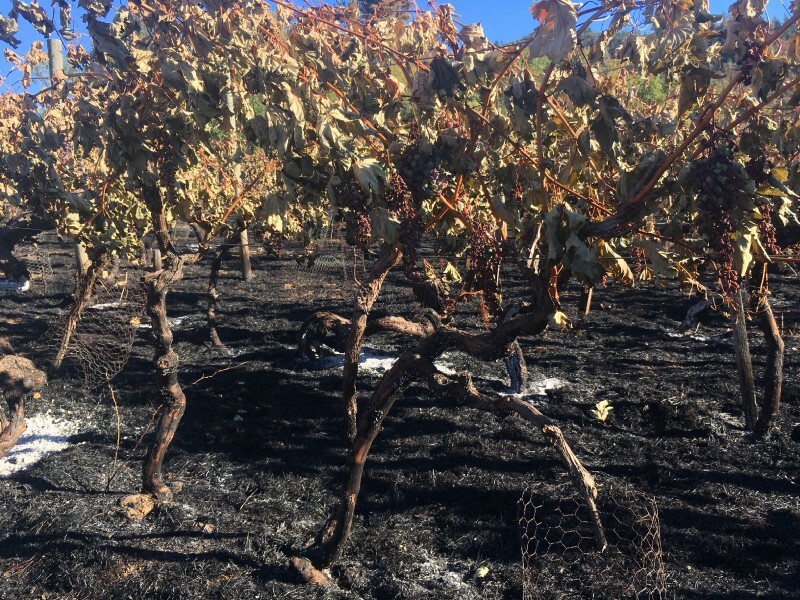 Our farm’s vines are burnt to a crisp, their one hundred year old trunks still smoking as bits of ash fleck onto the ground. Their leaves are burnt golden and ready to fall. Where once the olive groves were golden and green, now they are black and brown. Even the water tanks melted completely, leaving behind damp circular graves where water once was. It’s a sad, sad sight. The grapes, almost ready to be harvest shrivelled on the blackened vines. We are forever indebted to the volunteer firefighters and our neighbours for working courageously and with perseverance through the night to save the buildings. 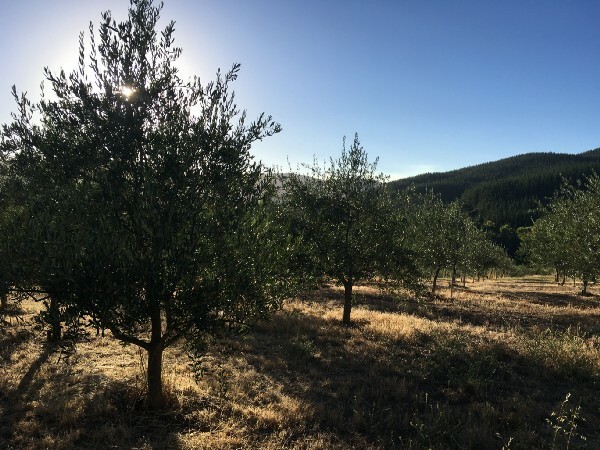 The true extent of the damage will become clear next spring, when the olives and vines sprout new shoots of green — or they don’t. The vines that aren’t dead certainly won’t yield many grapes next year, as the plant remembers the stress of January 2017… but what about the year after? Will they ever return to full production? So many unknowns. Now we must wait — years. It’s so clear: you can’t just ‘pivot’ or take an ‘agile’ approach to farming. Things take time and can’t be sped up. This is even more true with our Vidacycle approach to regenerative farming, which goes beyond organic. We endeavour to listen, learn and work with nature in a way that allows natural lifecycles to flourish. Over the past ten years, we as a family have learned a lot through doing it ourselves, so many things that are specific to this little valley, this particular spot on earth that no one could tell us beforehand. We’ve also learnt a lot from the many amazing fellow smaller-scale farmers around the world and so have developed the farm using ideas of permaculture, natural agriculture and lots of solar energy. We’ve embraced the dryness of the land and the natural water sources, and from that learned to craft beautiful natural products such as our natural TINTE wine, agraz and olive oil. The fire of course is part of nature (although many people were arrested for starting the fires) but no one had foreseen how ruthless it would be — the thousands of acres of pine monoculture meant the fire travelled insanely rapidly and burst onto our farm with an extreme heat. An inferno. A little house used to be right here. This is where the fire entered our farm from the pines and burnt most violently. Interestingly the fire didn’t really progress much further than our farm. It was amazing how our many acres of native woodlands stopped the fire from reaching our neighbours, it just gradually trickled out, the regularity of the pine tinderbox was not around to carry the fire forward. So yes fires are natural, but monocultures are not, and it seems humans create an uncontrolled hell when we combine the two. At times, farming can feel like a lot of hard work. Looking out over the blackened landscape for months to come will be a constant reminder of what we are working with. And right now things feel kinda bleak. I can only think our society need new ways of relating to our food and farming systems. We need to share this risk more widely if sustainable farming businesses are to survive. All of our lives depend on food. All our food comes from farms. Let’s celebrate the work of farmers and their commitment to live through the highs and the lows, live with the unknowns and to feed us all. 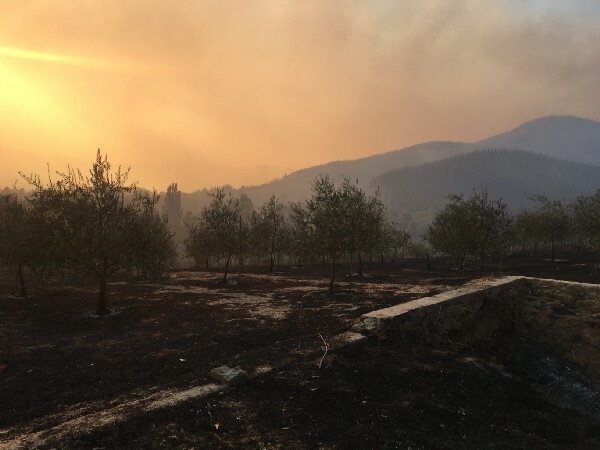 You can follow our story here and hear live dispatches as the fire happened on episode 18 and 19 of Farmerama, a podcast we help make, sharing the voices of the smaller-scale farming community. And you can read more about the damage the fire caused and some of the conundrums we found ourselves in here.